Ecostrip 600 is a highly effective water based, thickened emulsion paint remover. User/environmentally friendly, non-toxic, biodegradable. Not regulated by authorities for transport, storage, health and safety. Safe for use on most surfaces including wood, stone/brickwork and metals, can also be used for stripping plastics. For brush/roller/spray application. Telephone for volume discounts. The sun is shining, time to get the paint remover out on the internal and external surfaces! Our Ecostrip 600 product is an ideal DIY or Industrial paint remover. 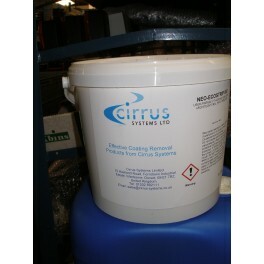 It is highly effective, water based, thickened emulsion paint remover (paint stripper). It Is user and environmentally friendly, non-toxic and biodegradable. The Ecostrip 600 is not regulated by authorities for transport, storage, health and safety. It is safe for use on most surfaces including wood, stone, brickwork and metals and can also be used for stripping plastics. Formulated for brush on, roller or spray application. This paint strippping product has proven to be more effective and efficient than the previous RemovAll range on wood, masonry and metals including steel and aluminium. The product has also been incredibly successful in removing powder coating from steel within 3 hours. This product has no UN number for transport. This is a UK manufactured product. This product replaces the RemovAll range WCR1, RemovAll 320, RemovAll 520, RemovAll 220. This product has proved more effective and efficient than the previous RemovAll range in all trials.